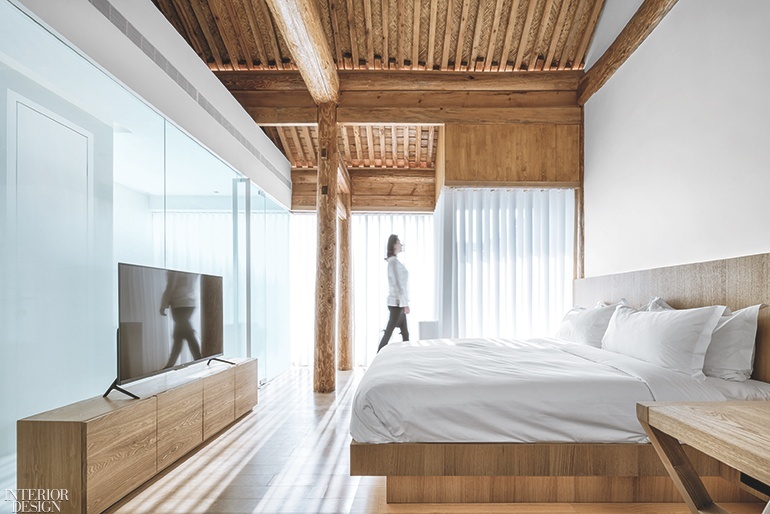 Today’s savvy global travelers seek out unique experiences as much as they do high-quality bed linens and in-room espresso makers—a consumer preference that generally inspires hospitality designers to chase after and incorporate mercurial trends. 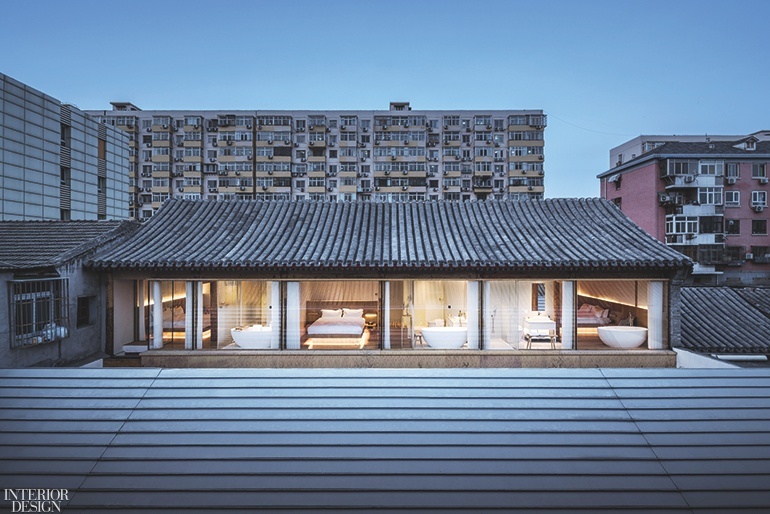 But when creating a boutique hotel near Beijing’s Qianmen Gate, Archstudio took cues not from passing fancies but from a fixture of historic neighborhoods: the traditional siheyuan compounds that once formed urban buildings blocks but are now more often casualties of redevelopment. The local firm reinvented a 5,700-square-foot quad­rangle into Layering Courtyard, a mixed-use bed-and-breakfast and events space—and a self-contained oasis in the bustling city. 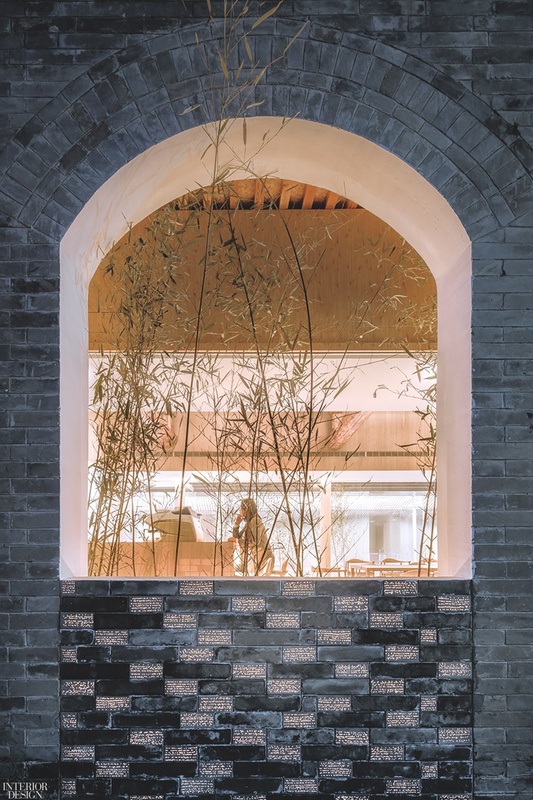 Original brickwork from the early 1900s distinguishes the street-front facade of Layering Courtyard, a boutique hotel in Beijing by Archstudio. Photography by Luo Juncai/Creatar Images. Though some such courtyard houses date back many centuries, this particular one, a former bakery (and onetime brothel), was constructed in the early 1900s, during China’s republican era; the arched windows and doorways in the street-facing facade are an architectural signature of that time period. At one point, the Chinese government partially renovated the site, but it then sat unused for several years before the client, Hutel, acquired it. “When we first toured the complex, the courtyard was overgrown with weeds and the beams and columns were bare and dilapidated,” Archstudio founder and principal architect Han Wenqiang says. Transformation required extensive repairs and structural improvements. 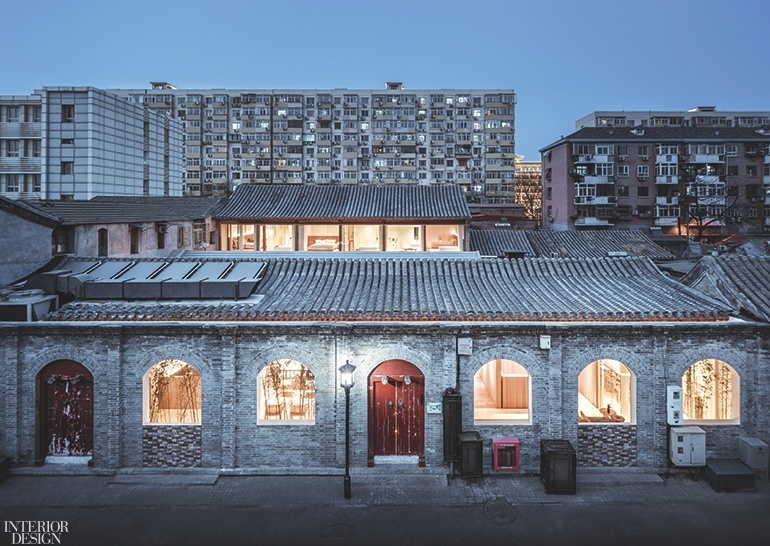 The “layering” in the property’s name refers to the new floor plan, which departs from the typical siheyuan layout, where perimeter buildings surround all four sides of a central courtyard. 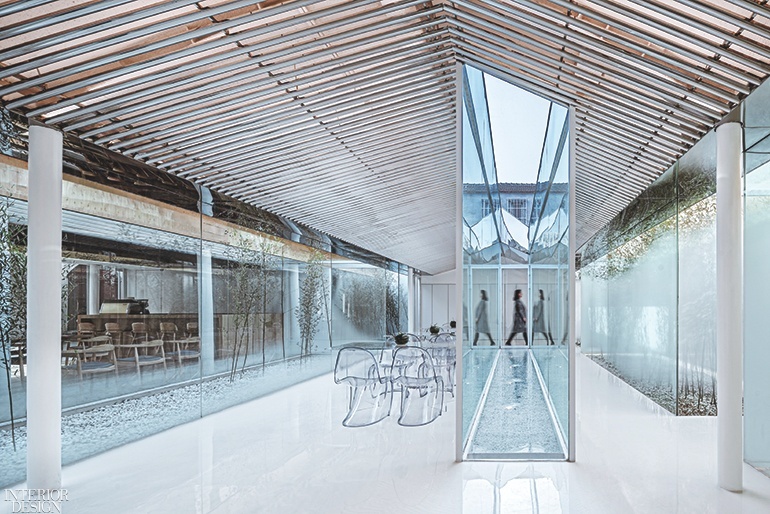 Instead, Han and his team mapped out a trio of rectangular pavilions, oriented parallel to each other and bordered by slim glass-enclosed light wells. The front and rear buildings make use of the existing structural elements, while the middle one is entirely new-build. Epoxy flooring paves the central multi­function area, outfitted with acrylic tables and chairs and pierced by a glass-enclosed water garden. Photography by Luo Juncai/Creatar Images. Each building performs a particular function—dining hall, event space, sleeping quarters—although the borders between them are porous rather than finite. A red-painted door permits entry to reception, which deposits visitors in the most public area: a dining room with a bar and an adjacent kitchen. 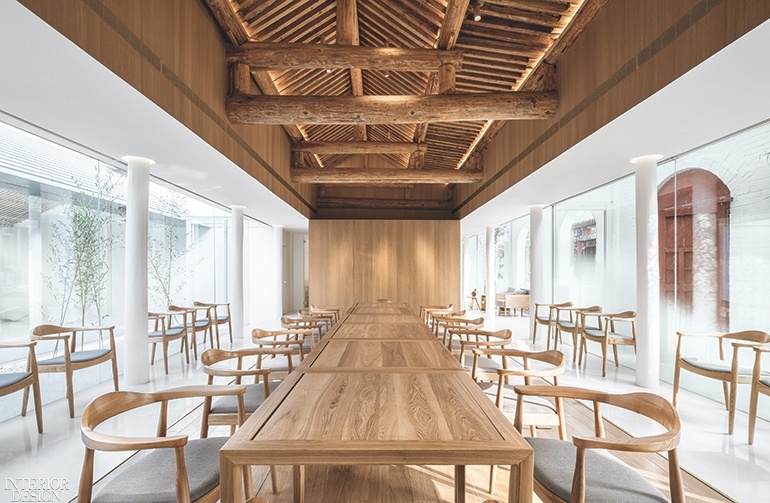 Timber beams, some original, coexist with white poured-epoxy flooring and oak-veneered partitions, the same warm-toned wood as the tables and chairs. Glass curtain walls enclosing the space have a frosted film, suggestive of rising mist, that conjures both separation and cohesion. 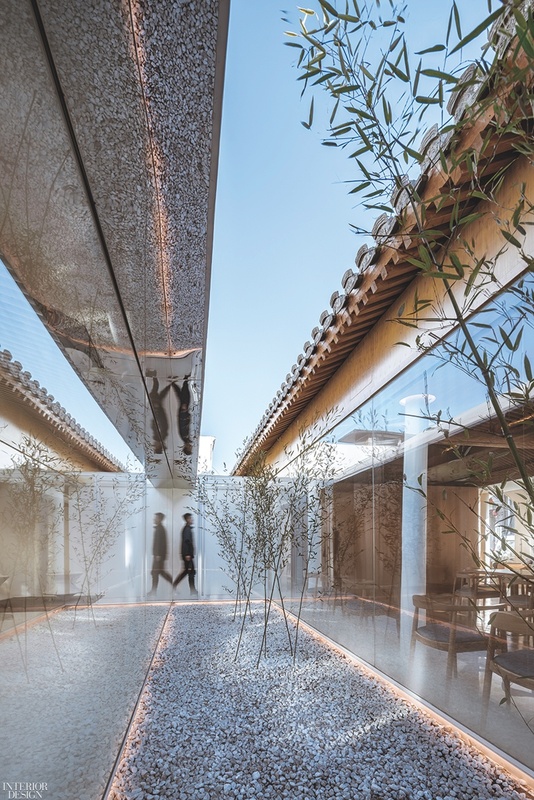 A pair of glass-box corridors entice guests past a bamboo-planted light well to the multiuse central pavilion, with steel columns supporting a seamed aluminum-composite roof. Materials here are intentionally transparent or reflective, Han notes, to contrast with the weightier historic elements. Tables and chairs in clear acrylic line up along an alfresco water garden that punctures the room’s center. Forming the ceiling plane are rows of mirror-polished stainless-steel tubes that hide light fixtures while also serving to blur and confuse spatial boundaries. In a guest room, original timber columns and ceiling beams meet new flooring of laminated white oak, the same wood used to craft the custom bed. Photography by Luo Juncai/Creatar Images. This chameleonlike event zone can be annexed by the dining area, serve as a meeting/lounge area for the guest rooms, or be used on its own for exhibitions or lectures. Layering Courtyard is an adaptable environment. For instance, a company could rent the entire property to house executives in town for a conference, conduct meetings during the day, and throw a cocktail party afterward—all at a single venue (and one that’s far more intimate than a cookie-cutter upscale hotel). A gallery can mount an off-site show there and host the visiting artist and the post-opening vernissage. Out-of-town tourists can book one of the seven guest rooms for their own use, and enjoy morning coffee at the bar before a day of sightseeing. It’s a concept Archstudio and the client pioneered at another project, Twisting Courtyard, just down the street. You feel more removed from public life as you pass through the layers of spaces toward the guest accommodations, which are spread over two floors. “Privacy gradually increases as you penetrate the property,” Han explains. 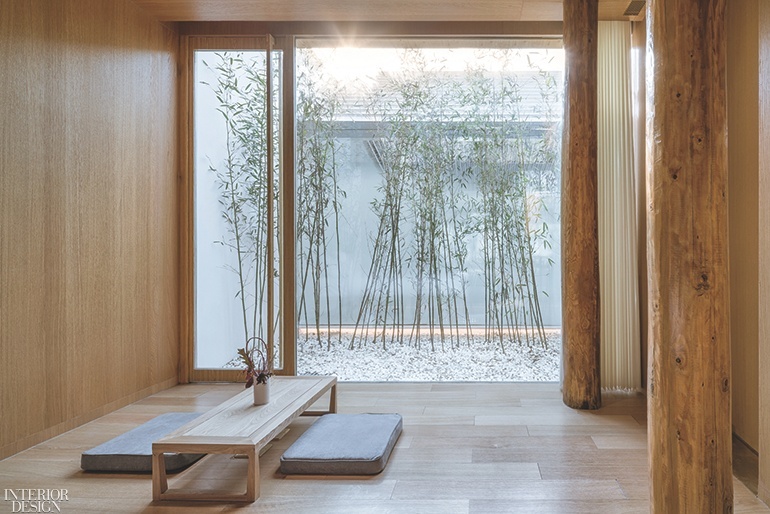 The rooms are strikingly plain and calm, like oak-wrapped bento boxes with full-height windows surveying semiprivate bamboo court­yards, which are accessible via the four ground-floor rooms. The liberal use of oak for flooring and veneered paneling—plus the copious glass—creates a gallerylike setting that effectively shifts attention to the occupants and the views. 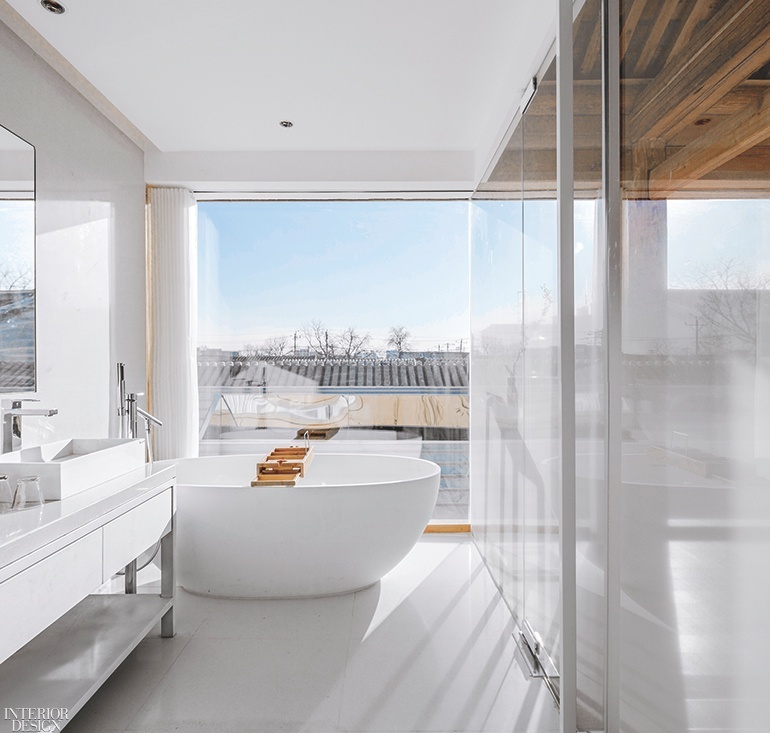 A change of palette to white quartz distinguishes bathrooms, which in the upstairs rooms are rather exhibitionistically placed near the windows. Archstudio eschewed common decor tropes such as individually curated rooms and reference-heavy local touches in favor of a what could be called bold serenity. The modern world being what it is, some trends have made their way into the operation, of course. Travelers demand seamless experiences, so Archstudio incorporated such up-to-the-minute advancements as facial recognition software and code-scan check-in. So although your trip might be for work, staying here will in no way be business as usual. The dining room, with restored ceiling beams, is enclosed in full-height glaz­ing that’s been partially frosted. Photography by Luo Juncai/Creatar Images. Another room features a contemplation space and access to a bamboo garden. Photography by Luo Juncai/Creatar Images. New windows were fitted in the facade’s original arched openings. Photography by Luo Juncai/Creatar Images. A guest bathroom overlooks the property through double-insulated glass. Photo­graphy by Jin Weiqi. A gravel-paved light well planted with evergreen bamboo separates the multifunction area and dining room. Photography by Luo Juncai/Creatar Images. The seamed aluminum-composite roof topping the new central pavilion meshes with the original stone shingles. Photography by Luo Juncai/Creatar Images. 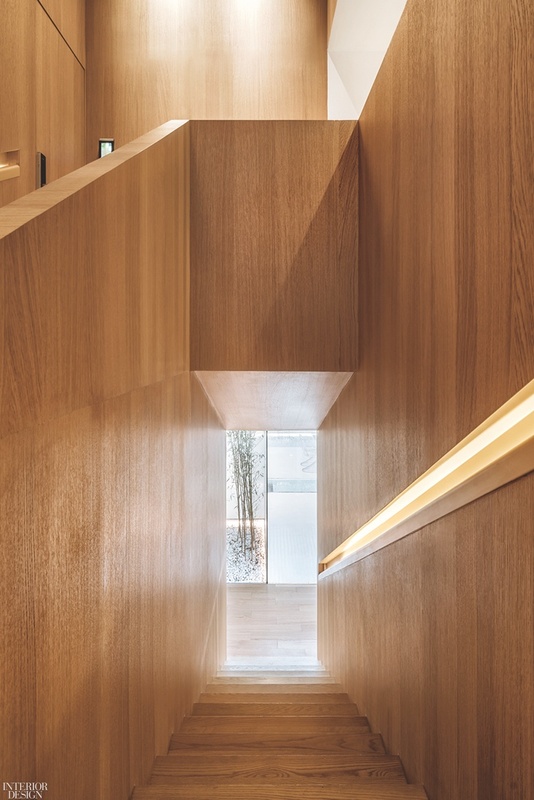 Oak-veneered paneling clads the stair­well linking the two floors of guest rooms. Photography by Luo Juncai/Creatar Images. Floor-to-ceiling curtains can be pulled for privacy in guest bathrooms. Photography by Jin Weiqi. The same wood finish animates the bedroom of a ground-floor room. Photography by Luo Juncai/Creatar Images.